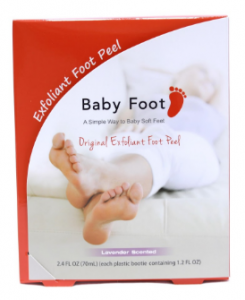 Baby Foot™ is an innovative Japanese foot care product for softer, callus-free feet – all at the convenience of your own home! The unique formula of 17 natural extracts exfoliates your skin, removing unattractive dead skin cells that have accumulated from pressure and friction of everyday activities. Prep your feet. Soak your feet thoroughly, allowing skin to soften for maximum gel penetration. Apply Baby Feet. Cut along the dotted lines of your wrap, place your feet in the wrap, and secure with tape. You can enhance your experience by adding socks and shoes over the wraps. Relax. Wait an hour to allow the gel to fully penetrate your skin. This is a perfect time to catch up on your favorite TV series or read the next chapter of your favorite book. Remove the wrap. Rinse your feet free of the gel, and let the magic wrap do its work! Contact us below to learn more about how we can help your feet feel softer and smoother, or stop in to our MedSpa to pick up a Baby Foot wrap! Our providers will work with you to develop a treatment plan to help you reach your beauty goals! It takes a little over an hour to prep, apply, relax, and remove the treatment. We recommend using it every 2 months for optimal foot care, but this varies by client depending on how quickly your feet build up dead skin cells. If you would like a second treatment to enhance the first and remove any remaining dead skin, simply repeat the process 2 weeks after your initial treatment. To speed up the peeling process, soak your feet daily. If you would like to bathe, simply rub your feet gently with your hands after bathing. Dead skin cells will start to peel 3-7 days after your treatment, but it can take up to 2 weeks to peel completely. Most people are able to use Baby Foot; pregnant and nursing women should not use it. If you are diabetic, have open sores on your feet, or have other foot damage, please consult your primary care physician before starting Baby Foot.